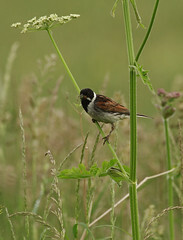 In my last post I visited Danbury Common in Essex. 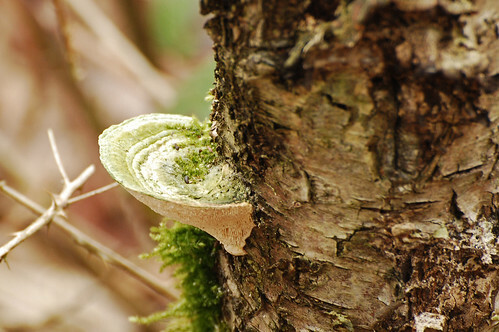 After getting over the disappointment of not seeeing snakes we headed to Blakes Wood which is another National Trust site situated on the opposite side of Danbury to the Common. 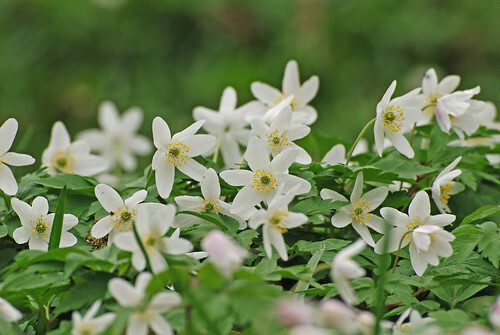 It’s an area of ancient woodland, predominantly hornbeam and sweet chestnut under which the ground was covered in withered chestnut husks emptied of their contents long ago by squirrels or mice, and in the springtime wood anemones (Anemone nemorosa) and bluebells (Hyacinthoides non-scripta) carpet the forest floor. 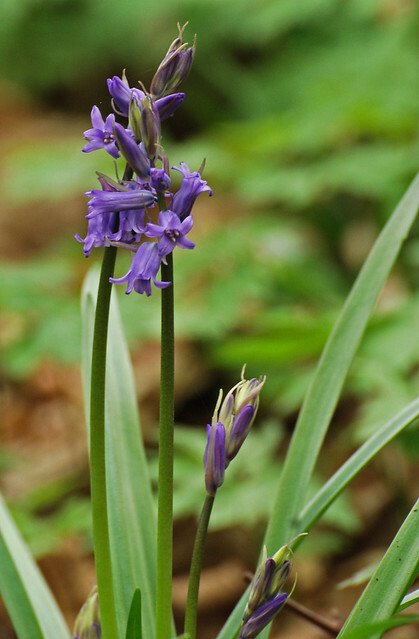 Bluebells have been voted Britains favourite flower and they normally reach their flowering peak in mid May. Bluebells are delightful flowers when there is only one plant, but when they stretch across a forest floor as far as the eye can see they’re absolutely magical. 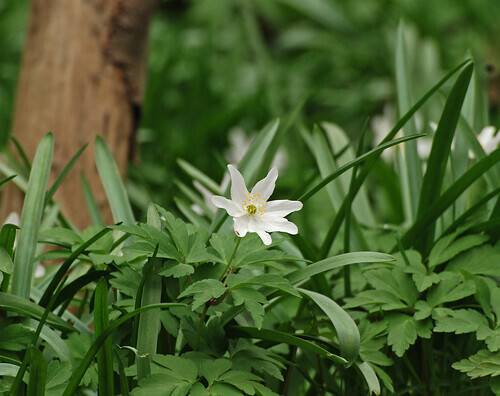 I didn’t expect to see any at the weekend, it still being March, but they are starting to flower already. 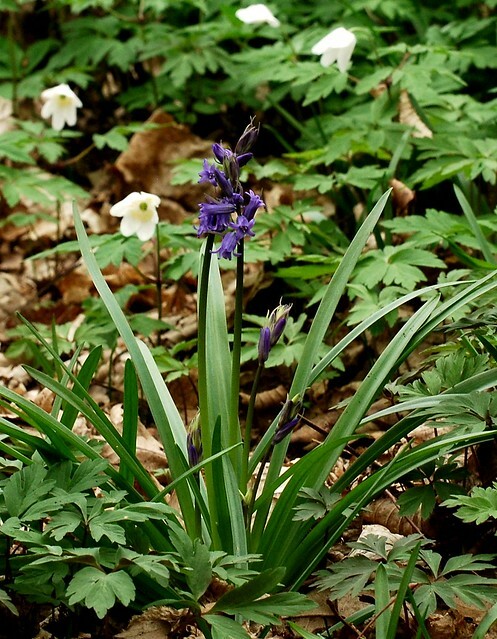 The Natural History Museum is conducting a survey of bluebell flowering times as a means of monitoring climate change. 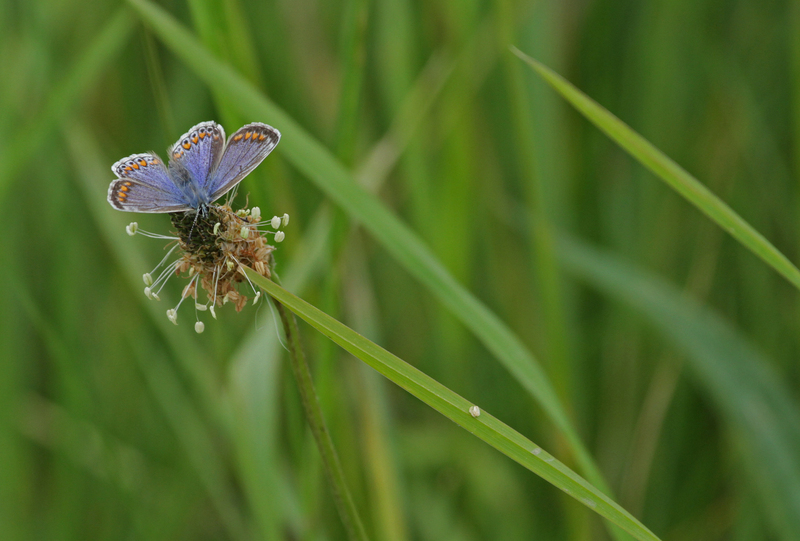 A quick glance at the data is starting to get alarming, the earliest flowering time seems to be getting earlier, from first flowerings in Essex in May in 2010, moving to the middle of March in 2012, in just three years since the study commenced. I don’t know what the long term ramifications of climate change will be for our native flora and fauna, we’ll have to wait and see but I hope the bluebell woods survive. 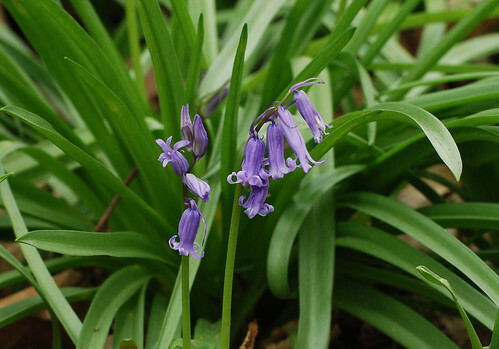 Spanish bluebell bulbs have been sold in garden centres but they are a different species, Hyacinthoides hispanica, to our UK bluebells. Flytipping of garden waste has resulted in the Spanish variety getting into our woods and cross breeding with the native species. This is a real problem because it is anticipated the hybrids may eventually take over from the natives, but I console myself that the invaders and hybrids are lovely to look at too. I can’t wait to visit the woods again in May when the bluebells are in full bloom, and when I do I’ll share the results with you. 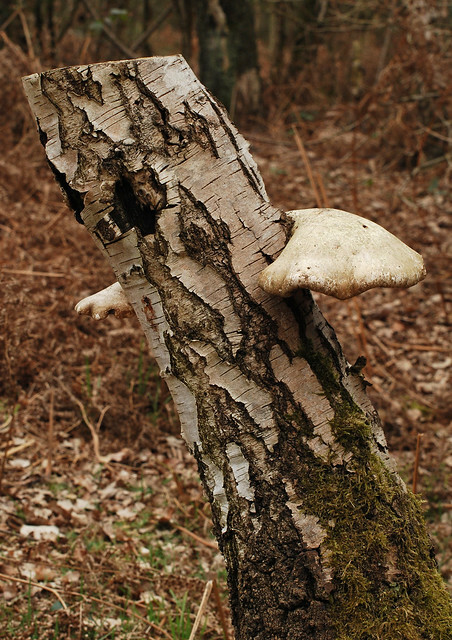 Danbury Common near Chelmsford in Essex is a National Trust site that is a mixture of woodland and heathland and is renowned for reptiles, in particular teh European adder (Vipera berus). The weather for the last 2-3 weeks has been ideal for resurrecting hibernating reptiles so myself and my friend, Dave, who is a very accomplished nature photographer, went along to try to get some pictures of adders. 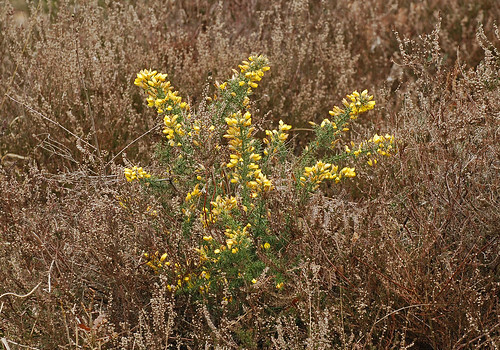 They are the only venomous reptile native to the UK and their preferred habitat is heathland. Dave originates from Essex and is familiar with Danbury Common and assured me that we would definitely see adders, so I was rather excited as I’ve never seen a wild one before. Unfortunately two events conspired against us: the weather on Saturday morning was the coldest it has been for weeks and with 100% cloud cover there was little warmth to entice the adders out of their burrows, and secondly there had been an accidental fire right over the main hibernaculum, all of which resulted in the total absence of adders and any other reptiles! 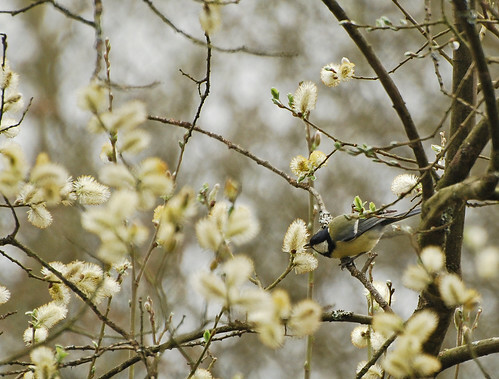 Despite that, the Common is a great place for wildlife so we wandered around to see what else was in residence and were rewarded by the first blackcap (Sylvia atricapilla, Dansk: munk) and chiffchaff (Phylloscopus collybita, Dansk: gransanger) sightings of the year for me. 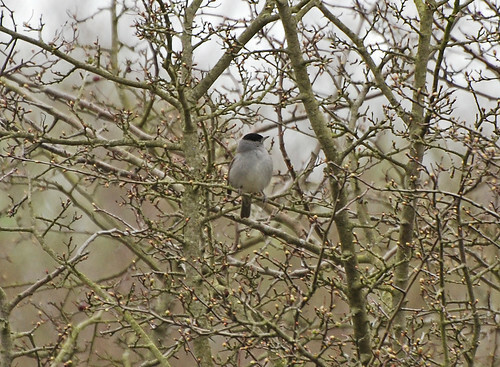 Until recently blackcap were considered to be summer migrants to the UK, spending there winters in sub Saharan Africa and as far down as South Africa. 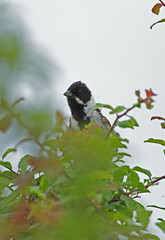 More recently they have been winter residents too and it is thought this is the result of westward migration of birds from eastern Europe and also from the Low Countries, not our summer residents staying put. 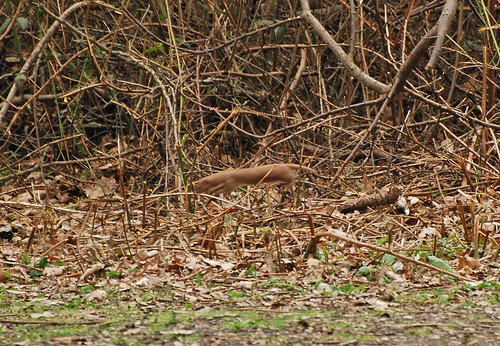 They disappear from my regular haunts around Histon in the winter, but my friend who lives on the other side of the village, just half a mile away, has been hearing them sporadically through the winter. 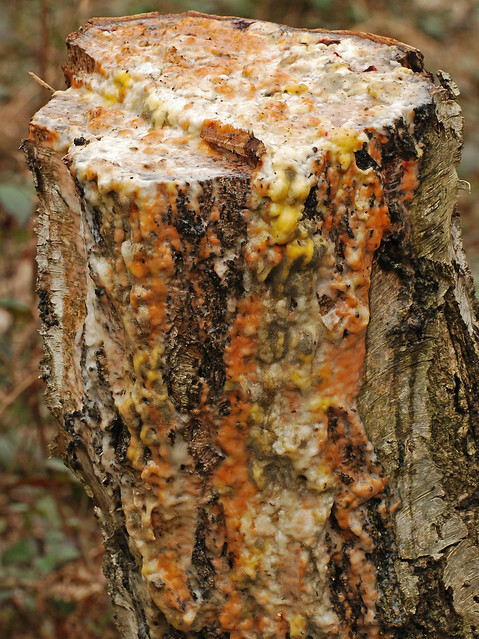 I’ve never seen anything quite like this before but it appeared the sap had welled up out of the felled tree and the sugar rich solution was providing a glut of nourishment to opportunistic fungi. 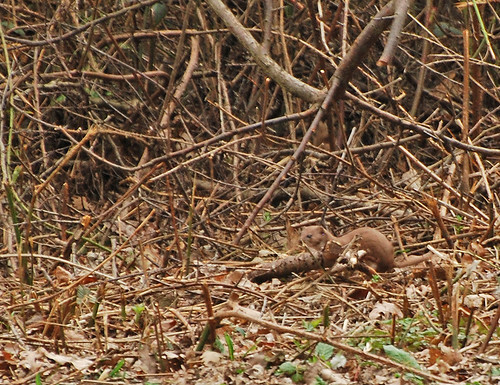 The highlight of the trip, in the absence of snakes, was a weasel (Mustela nivalis) which bounded across the path and stopped to scrutinise us for long enough to take a couple of photographs. 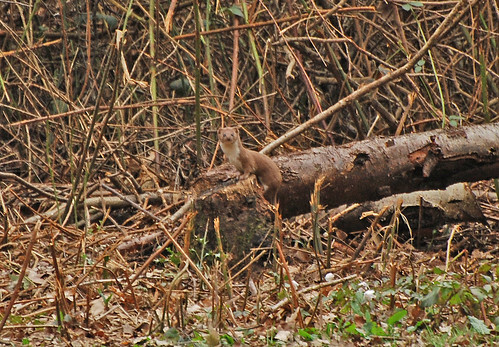 It’s years since I’ve seen weasel and we had to zoom in on the pictures to decide whether it was a weasel or a stoat (Mustela erminea). 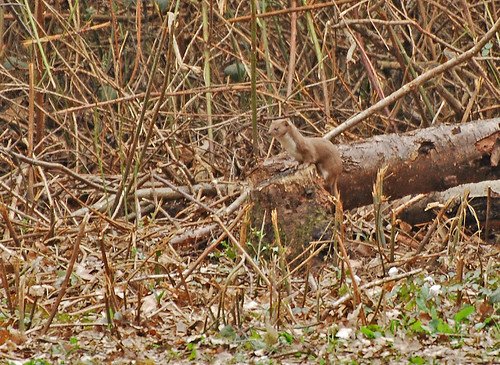 The stoat is around 30cm long so is bigger than the weasel which is around 20cm, and the stoat has a black tip to its tail which our little creature didn’t. Stoats go completely white in the winter except for the black tip of their tails and it is the pelts of the winter stoat which are used to make the ermine gowns of members of the UK House of lords. And he was off, like a brown furry exocet, at quite phenomenal speed. The pictures aren’t very good quality, but you can clearly see what he is and it may be a good few years before I get to photograph another! I’ll try to get to Danbury again over the summer and if I manage to take some pictures of an adder I’ll post them here.